The Trump administration sent multiple letters to Congress this week asking it to give federal agencies less money than lawmakers are planning, continuing a pattern in which the White House has said it needs less money to run the bureaucracy than the Republican-controlled Congress wants to allocate. In a series of letters to both the House and Senate appropriations committees, Office of Management and Budget Director Mick Mulvaney suggested lawmakers not spend as much as they are allowed under a budget agreement President Trump signed into law in February. While appropriators are in the process of drafting bills to allocate fiscal 2019 funding under the 2018 Bipartisan Budget Act, Mulvaney said they should ignore those totals. “Given the nation's long-term fiscal constraints and the need to right-size the federal government, the administration does not support spending at the [Bipartisan Budget Act's] non-Defense caps,” Mulvaney wrote. In the most recent iterations, the budget director requested that leaders on the Senate Appropriations Committee slash spending in more than a dozen programs in their bills to fund the departments of Agriculture and Energy, and related agencies. The Agriculture bill would grant 38 percent more funding than the White House’s request, while the Energy measure would appropriate 19 percent more than Trump’s ask. Mulvaney had sent similar letters to the House Appropriations Committee on measures to fund the Transportation, Housing and Urban Development, Commerce and Justice departments and the legislative branch, as well as Agriculture and Energy. 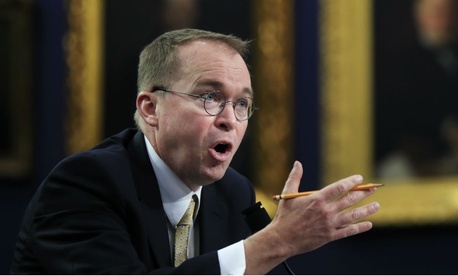 In each version, Mulvaney suggested the “long-term fiscal constraints” of the country necessitated lower spending thresholds and spelled out precisely which programs the administration viewed as overfunded. Blair Taylor, a spokeswoman for Senate Appropriations Committee Chairman Richard Shelby, R-Ala., said the panel would work with the administration, but noted the Energy and Agriculture bills "garnered strong bipartisan support in committee, which is critical to moving the bills through the Senate and to the president's desk." The White House has made no secret of its displeasure with the domestic spending under the budget deal. It is currently working with Republican leadership to rescind spending from fiscal 2018 appropriations, which Trump blasted while signing the budget deal into law. Mulvaney has voiced his concerns in testimony before the appropriations committees, though lawmakers appear uninterested in addressing them. They may be forced to eventually listen, however, as Trump has vowed to never again sign an omnibus spending package that he deemed too large. He has also requested line-item veto authority to address parts of spending bills with which he does not agree, which Congress has similarly shown no interest in supporting.